Defending against multiple attackers is a serious business as compared to defending against a single attacker, which is already serious enough. When a student faces two or more opponents, (s)he discovers the need for heightened awareness. In addition, the karate-ka must employ a different set of strategies. Because of the increased complexity of this scenario, I have created an exercise that allows a student to concentrate on awareness and strategy by simplifying the situation. This exercise is Padded Multiple Attackers (PMA). This is accomplished by using hand-held, medium-sized punching bags to level the playing field in terms of skill of technique. The basic form of this exercise requires three participants (one defender and two attackers), one referee, and three punching bags. Each participant holds one bag. These bags are the key to the exercise. They create a setting in which all participants are all considered equally skilled at one-on-one fighting. It becomes strategy that one must use to overcome one's multiple opponents. For each participant, the bag represents his or her "guard." While the participant must remain aware of the environment, (s)he has only one guard and thus can be directly engaged with only one opponent at a time. This is accomplished by using the bag to "attack" an opponent by attempting to touch his/her body with the bag. If the opponent responds by bringing up his/her own bag and blocking the attack, then both guards of both participants have cancelled each other out. It is only by directly contacting an opponent's body with the front face of a bag that a participant "takes out" an opponent. The goal of the attackers is to "take out" the defender. The goal of the defender is to "take out" only one of the attackers, and thus end the exercise. The basic exercise ends here because a one-on-one setting is outside of PMA's scope, and it would therefore be mostly pointless to continue. With this said, the following guidelines were developed through experimentation with this exercise. If the defender is doing a good job of defending (i.e., not being "taken out"), then the referee may decide that the defender has created a psychological advantage that leads to an increase in the quality of the defender's technique. Because of this, the referee may call one of the attackers "out." Use greater numbers of attackers. Instead of assuming an attacker/defender relationship, set the goal for each team to "take out" all members of the opposing team. If the end result is a 1:1 situation, it is considered a draw. Instead of teams, create a "free-for-all." These are just a few variations designed to spur the imagination. Have fun with it! This article does not cover many lessons that can be taught/learned using this exercise. I hope that many Programs throughout the Association find this exercise beneficial. If you have any questions or comments about PMA, please feel free to contact me through my e-mail address. I welcome any discussion! I would like to say one more time, just because it is so important: Have fun with it! Thank you to Brown Belts Bennetts, Edwards, Wilkewitz and Jordan for their help in "play-testing" PMA. 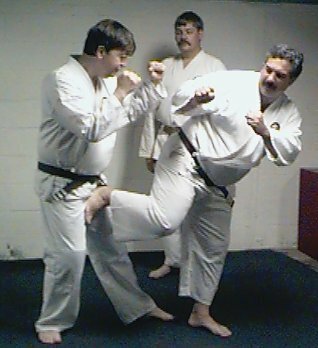 Nikyu Chuck Fussman has been training under Sandan Daniel Wilkewitz at the Chung Fu-do since 1996. He is a Computer Help Desk Supervisor. He can be reached at csfussman@visto.com. My Mom gave me an article from the local paper concerning Guy Waterman. Guy was a well connected political speech writer in Washington in the early 1960's when, one night in alcoholic blur, he decide to give up this career. He married the girl of his dreams and moved to a small cabin, that had no electricity or indoor plumbing, in Cornish, Vermont. From that cabin, Guy pursued his true passion, mountaineering. He and his wife taught technical climbing seminars in New York, and maintained trails in Vermont and New Hampshire. Guy and his wife raised two sons who became world class mountaineers. Guy and his wife also were tireless supporters of local charities and arts in their community. In their spare time Guy would entertain his family and guests with poetry readings and his piano playing. One morning in January, 1999, Guy kissed his wife, walked out of their cabin, and hiked up to a predetermined location on Franconia Ridge and froze to death. His wife cried for three days. The ghost of Guy Waterman has haunted me ever since I read that article. Possibly because Guy and I both share a love for the mountains, baseball and jazz music. But more so because Guy seemed to have so much going for him. A loving wife, his health, and many varied interests. Why then would Guy Waterman kill himself? Disease, mental illness, the death of his oldest son on Mount McKinley? These are all possibilities and I can only speculate as to the cause. As martial artists we are exposed to tools that help us cope with whatever comes our way in our lives. Physical exercise to keep our bodies healthy. Meditation to keep our minds and bodies healthy. And a philosophical foundation that allows us to apply our art in such a way as to help us flourish in our environments. I cannot predict how I will react when I get old (OK, older than I am already.) and my feet are totally arthritic and my knees and hips have been replaced. What I do know is that through meditation, working on my kata and basics and staying rooted to my philosophical foundation, I can best prepare myself for whatever drove Guy Waterman to hike up Franconia Ridge that cold Winter's day. Nidan Russ Jones lives in the Lakes Region of New Hampshire where he founded the Sachem Self Defense School. He began studying martial arts under Grandmaster Rose in September, 1985. Nidan Jones is a Senior Software Engineer at RiverDelta Networks in Tewksbury, Ma.. In his spare time, he can be found snowboarding, hiking, playing bottleneck slide guitar or doing kata in the park next to his house. Nidan Jones can be reached via email at: elizibethreed@yahoo.com. The series of pictures in the header of this issue of C&S Online depict a self defense technique called "Nose To Toes". It was brought to us by Senior Dragon Master David R. Landers a couple of years back. I wanted to be sure that everyone in the Association was aware of this technique because it has wide spread application in many non life threatening self defense situations. But this would be an unacceptable solution in a health care environment; perhaps even too much for an inebriated individual who is giving you a rough time. Something more "gentle" and controlled is needed. Nose To Toes is a reasonable solution. Let me take you through it. Form your arms as you would if you were diving into the water. The idea is to use your arms as a wedge inside the charger's arms so that you can get your arms between the charger's arm and neck. Do this as if you were diving into a pool. Tuck your head down between your arms and just dive between the attacker's arms. This is not intended to be a "graceful" move. You are to simply throw yourself into the attacker. At the same time, ram your knee into the persons side. 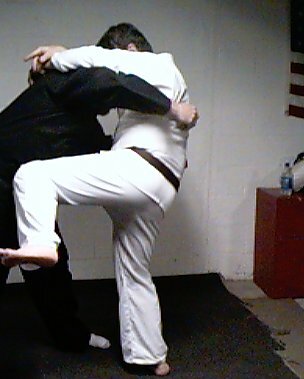 Be careful that this knee strike is not done as a forward knee strike to their stomach or midsection as you will not only stand a chance of bouncing off of the person and ending up in a fairly bad tactical position, but you could seriously injure the person. The knee strike should be done as a roundhouse knee strike. All you are trying to do is hit the person low enough on the side (not the front) to make them bend forward around you- even if they end up wrapping their arms around you. With the person now bent forward, your arms are in the correct position to apply the Nose-To-Toes technique. Now, simply place at least one of your hands, preferably both, onto the top of the back of the persons head and push downward and backward as if you where trying to force the charger's nose to their toes. You will be amazed at the leverage you have, and of how easily a person drops to the ground onto their stomach! And best of all, you have not injured the person in an unwarranted situation. I have even taught this to my two kids when they were 10 & 12, and to my nephew's young son. It gives them something effective to repel a very common situation in a relatively harmless manner. Grandmaster Peter M. Rose holds an 8th Degree Black belt. He began his studies with Grandmaster S.A. Brock in 1968. Grandmaster Rose is a senior software analyst, designer, and technical project manager. Grandmaster Rose can be reached at zzrose@yahoo.com. We can't see what the opponent is doing and we may get jammed up. We may do more damage than we might have intended because the opponent may have changed their position to put them in a substantially more vulnerable situation. 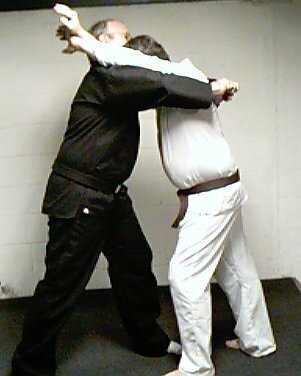 Generally, I teach these techniques as "reactive" movements when the opponent suddenly charges in and you sense openings that you can attack only from the side vs. head on. There are numerous variations of each of these techniques, though I would like to discuss a variation of the Spinning Back Hook Kick: the Spinning Upright Mule Kick. The Spinning Upright Mule Kick is derived from a combination of both the standard Spinning Reverse Roundhouse Kick and Spinning Back Hook Kick as well as the Mule Kick. This can be seen in the following figure. We all know the Spinning Reverse Roundhouse Kick. The Spinning Back Hook Kick is done like a Spinning Reverse Roundhouse Kick, but the knee is bent and penetration is made with the bottom of the heel. In the Mule Kick, you drop to the ground on your forearms and shoot a Back Kick upwards into the opponent. Thus, the Spinning Upright Mule Kick is an amalgamation of all three of these kicks. In the following figure, IkKyu James Mason is taking SanKyu Scott Williams on the right through the kick using SanKyu Rick Downs as the attacker. Note the "hook" in Scott's leg, and that the firing path lies not horizontal as in a Spinning Reverse Roundhouse Kick or Hook Kick, nor is it completely coming up from the ground as in a Mule Kick. Now, I don't have a check off sheet with "Spinning Upright Mule Kick" as one of the items. Rather, I teach a Spinning Back Kick and pretty much leave it at that. During the course of class analysis or discussion, positional concepts invariable lead to break down analysis similar to this derivation. Far better for the student to "discover" a technique like this than for me to "teach" it. My teaching methodology is to "teach fundamentals" and let class discussions lead to derivational analysis similar to this. I present this technique only for those of you who have not got to this point in your study yet to impress upon you the need to really, really, really understand your fundamentals. If you do, then derivational analysis like this will make great sense to you. You will not try to "memorize" the technique, but rather you will try to understand how a technique can be extended into numerous other "untaught" techniques- each with its own specific utilization. And yet, you will remain confident that no matter what happens on the street: a back kick (in this discussion) is just a back kick no matter what fancy derived name you stick on it! Know your fundamentals! !